I was there, at IBM Connect 2013. My second Orlando visit was far more greater this time. 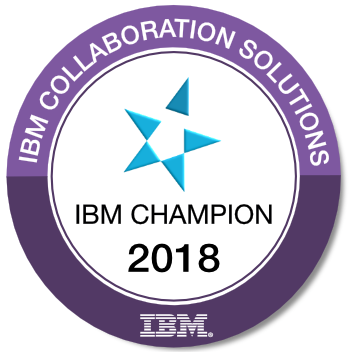 A speaker badge combined to the IBM Champion ribbon, more experience and more fun! This year, my schedule was packed. I have planned lots of sessions and attended most of them. After last year's disappointment in BDD, I attended master classes on sunday and they were great! Two sessions were approaching development process in a different angle and they were especially exceptional. On sunday master class session, Nathan T. Freeman explained how to analyze any Notes application in a systematic way. Ryan J. Baxter and Mikkel F. Heisterberg had a best practices session when designing APIs for your applications. I have been a good boy and got social again... I enjoyed meeting new people, talking to IBMers and other community people. The most valuable information you can get is hidden in these conversation (most of them should be consumed with good beer!). The most important thing was my session with Bruce Elgort... I was not comfortable with the session because practices over Skype was too long and I was concerned about my accent. I have been speaking in front of crowd since I'm 19 and I have no problem about it. I am a passionated speaker and might talk several hours about a topic I really like. But talking in English? I was going to have an heart attack until 5 minutes before the session. "This is the epitome of what a Lotusphere session should be. Veteran and rookie speaker teaching us how to get better value of the tools that we already own. Great stuff!!!!"